If you have images that takes large space on your computer and want to share the images on social networks, emails and blogs. And also if you want to reduce the image size to save your computer space and internet bandwidth. There are multiple image compression tool available Windows to reduce image size. In that way I find VJC is an ultimate portable free tool available for Windows that reduces image file size without losing image quality and dimension. VJC supports JPEG supports .jpeg and .png images to reduce file size and that provides side-by-side comparison with originals. You can set compression level by maximum file size as your wish. 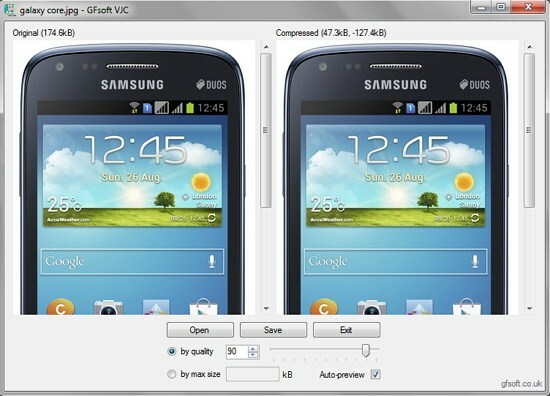 To compress your images with VJC, just drag and drop your image or click open and select your images. With in a second it compressed your image and shows original version and compression version side by side. Then click Save button to shave it to your computer. And share with your friends with minimum bandwidth.